This is what we did for the May 2012 Creative Challenge. Even though this challenge is over, I left the instructions and example card up as inspiration for you. If you do this challenge, please do show me what you make. I love papercraft owls and seeing how people used the Owl Builder punch (now sadly retired). You can use any owl shape now to make your project. You can even make a punch art owl with your punches and Bog Shot dies. some kind of night time owl as a feature. You must also use navy, shades of pink, yellow and/or orange in your creation. You may use my sample as a sketch or make one of your own. 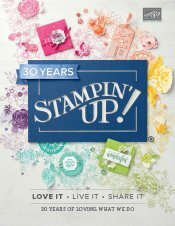 All supplies used are from Stampin' Up! either current or retired. I made my background with Night of Navy cardstock spritzed with Frost White Shimmer Paint (NLA) that had been diluted with rubbing alcohol and placed in a little spray bottle. I then used Cherry Cobbler below the navy cardstock and I tore and sponged the layer with Cherry Cobbler ink before adding a piece of Cherry Cobbler seam binding and drawing a line under it with a white gel pen. My owl is made out of Regal Rose (retired), Basic Black and Whisper White cardstock. 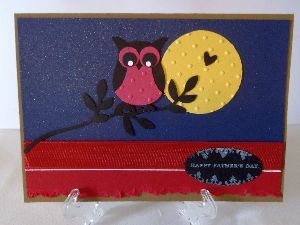 Of course I used the Owl Builder paper punch (NLA) from Stampin' Up! to make the little guy. It's a pity that particluar punch is no longer available, but try your hand at making a punch art owl without it. Then I ran his Regal Rose waistcoat and a So Saffron punched circle paper moon through my Big Shot using the Perfect Polka Dots embossing folder (NLA). I punched out three black branches with the bird punch (NLA) and glued them together with Tombow glue into a long branch for my owl to sit on. Then I stamped my sentiment and its flower frame in White Stazon ink on Basic Black cardstock (using the Tiny Tags, NLA, and Teeny Tiny Sentiments, NLA, stamp sets) and punched it out with one of my oval punches. TIP: Remember to stamp first, punch later. You can line your words up perfectly with your punch that way. I popped up my owl and sentiment on Stampin' Dimensionals and added a little black heart to the moon. I have to thank Adele Suda, a fellow Stampin' Up! Demonstrator here in Australia, for the card layout and ideas. I so enjoyed making this card, Adele and am glad you shared it. I think this card idea could easily be used on a scrapbook page, don't you?